The Israel Daily Picture site published a photo essay in September as part of a series on the 1936-1939 Arab Revolt. 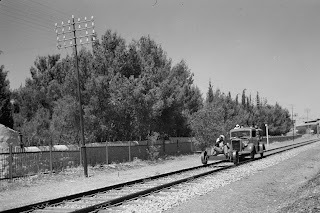 ﻿﻿The Arab attacks against the Jews and British in Palestine were frequently directed against motor vehicles and railroads. The essay's pictures from the Library of Congress-American Colony collection show the extensive damage to the trains and the special measures taken by the British, including armed escorts. One of the British army's brutal tactics was to put an Arab hostage on a flatbed in front of a rail car in the expectation that Arab terrorists would desist from planting mines on the track. We discovered this picture recently while viewing other pictures in the Library of Congress collection. The caption on the picture was incorrect, leading to the picture's misplacement, possibly for decades. During the Civil War, Confederate General Wheeler had his men place mines on roads he thought would be used by Sherman. Sherman had Confederate prisoners 'prove' the roads, so that Wheeler would stop. Of course the mines not tripped in combat would have been left behind to maim civilians after the war, so Sherman was right: Placing mines in that situation was a war crime, and reciprocity ended the crime.